This is one of the few Filipino recipes requested by my readers/subscribers who wanted to see it in my blog. I haven’t had the chance to make this in a long time partly due to my obsession with “pork humba” every time I have pork belly on hand. I know I’m a bit impartial but I love cooking humba better than lechon kawali. It’s less dangerous cooking-wise (less hot oil splattering), it’s more flavorful, and less greasy because the pork fat has to be rendered first. But in my desire to please my husband who celebrated his birthday this month, and who happens to love this deep-fried pork belly, I have to oblige. 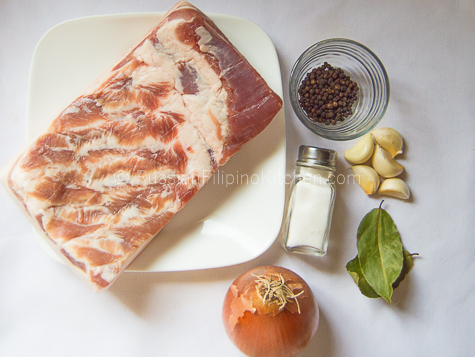 And of course, I care about my readers, and wanted to grant your wish, so here I am today posting my version of lechon kawali recipe so you guys can learn and cook this at home. 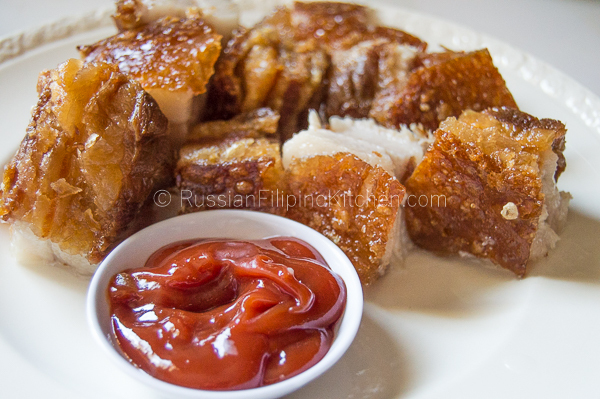 This recipe is adapted from Ms. Lalaine’s lechon kawali recipe at Kawaling Pinoy recipe blog. Lechon kawali is beloved meat dish in the Philippines. It’s pre-seasoned and pre-boiled pork belly deep-fried in very hot oil traditionally in a deep wok called “kawali”. 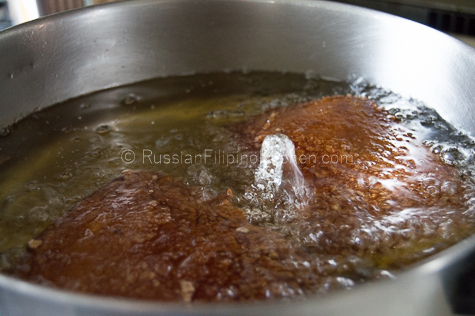 As the slab of meat is frying, one carefully sprinkles a small amount of cold water into the oil at intervals to get that blistered look on the pork rind or skin. Frying continues till browned and crispy. After frying, the meat is allowed to cool before slicing into serving sizes. Lechon kawali is best served with sauce or condiment of choice– usually lechon sauce, soy sauce, vinegar, sinamak (a concoction of vinegar, garlic, onions, ginger, hot chilis, and other spices), or ketchup. It’s worth mentioning why the dish is called lechon kawali. 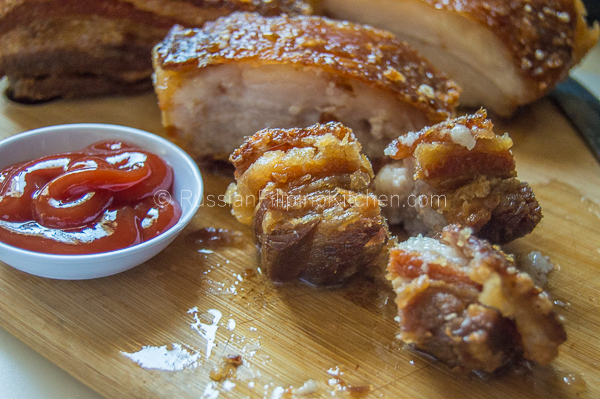 According to my research, ingenious Filipinos wanted to recreate the juicy meat and crispy pork skin of a roasted pig without having to roast a whole swine. So the idea of simmering a slab of pork belly in water with spices and later on deep frying in a Filipino-style wok was born. To non-Filipinos who wonder what the recipe name means, the term “lechon” refers to a whole roasted pig on a spit served during special occasions in the Philippines. “Kawali”, on the other hand, is a traditional Filipino deep frying pan with a handle present in most Filipino households. Making this dish is very easy but please be very careful with the “frying” part because you can get seriously burned when the hot oil splatters. Use a splatter guard, or cover the frying pan, whichever works. Also, keep a safe distance from the stove while the meat is actively frying (oil bubbling) and wait until the noise subsides a little, which means it has lesser chance for the oil to jump out of the pan. I have small kids at home who love to hang out in the kitchen. When I’m cooking this recipe, the kitchen is off-limits because it’s too dangerous for them. So please, be cautious. It will all be worth it. 1. Remove both ends of onion and peel. Cut the onion in half lengthwise. Place onion half cut side down and then cut crosswise. Repeat with the other half. Set aside. 2. 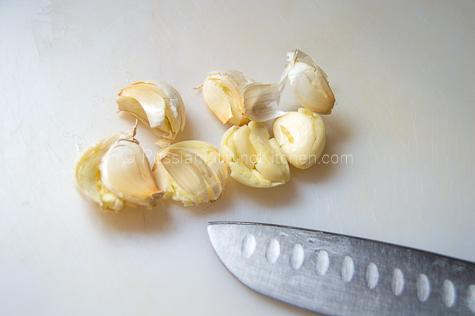 Smash garlic cloves with the flat side of the knife. Remove the skin and set aside. 3. Wash pork belly under cold running water. 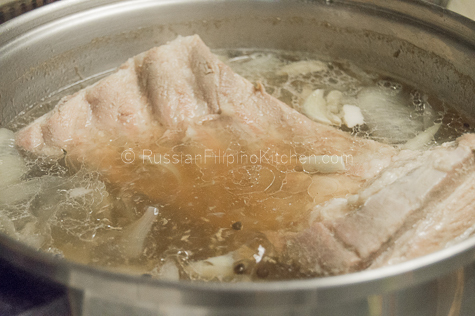 Place the slab of pork, smashed garlic cloves, onion, salt, peppercorns, and bay leaves into a large cooking pot. Add enough water to cover. 4. Place pot on the stove and bring to a boil over high heat. 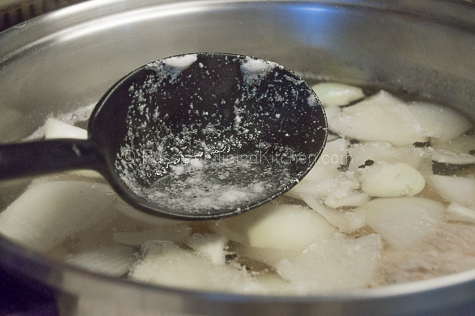 Once it boils, turn down heat to medium low and simmer for one hour until the meat is tender, removing scum (that dark layer of froth that rises to the top) with a spoon. To check pork belly for doneness, poke with the tip of a knife or pork. It should cut through easily. 5. Turn off heat and remove meat from pot using a kitchen tong, then place on a baking sheet lined with paper towels. 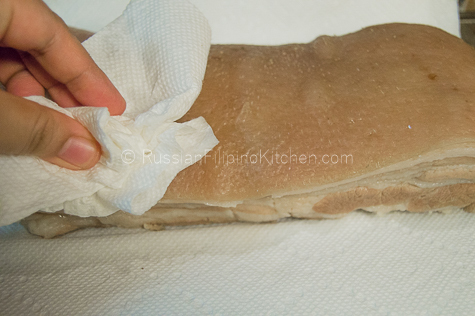 Wipe excess moisture and let it cool to room temperature. Note: Don’t throw away the pork stock. Strain and place in a container, then freeze or refrigerate for later use. It gives excellent flavors to soups and also great when making pancit. 6. 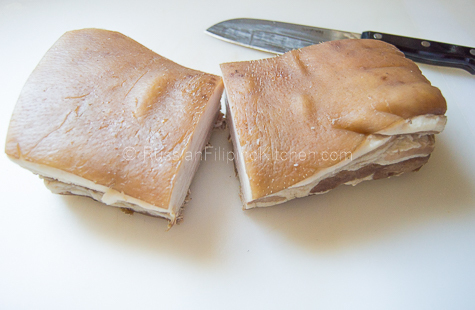 Remove pork belly from the fridge and cut in half crosswise. (optional step) 7. Turn on stove to medium high. 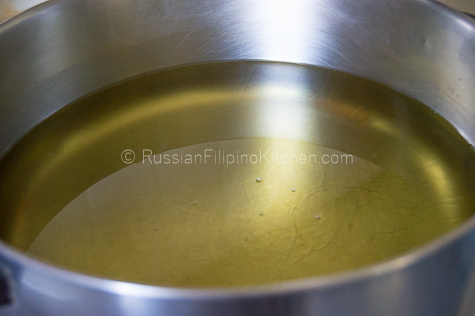 Fill a deep wok or frying pan with enough vegetable oil (about 4-6 cups). 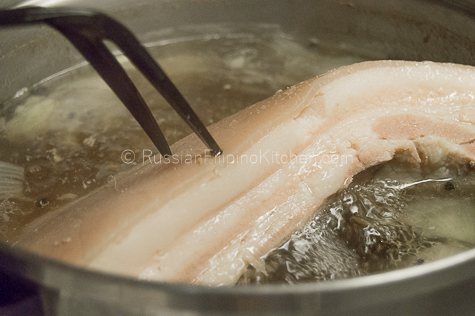 Wait for the oil to get very hot (shimmering but not smoking) and add the pork belly in to fry. Place a splatter guard on top of the pan and step back while it’s frying. The oil will bubble and you’ll hear a lot of noise at first. After about 3 minutes or so, dip your fingers in a bowl of cold water and carefully lift the splatter guard and sprinkle water into the oil. 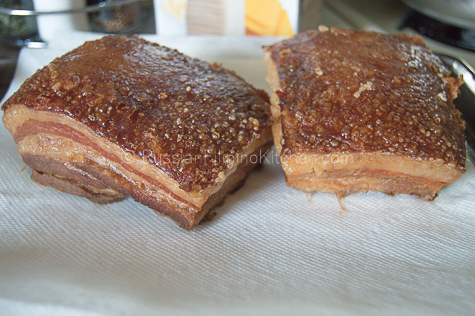 DO this a couple of times until the pork belly finished frying and it turns golden brown, and the skin looks puffy. But again, please use extreme caution! 8. Remove the meat from the pan and place on a plate lined with paper towels to drain excess oil. 9. Let it cool completely before slicing into serving portions. Arrange on a plate and serve with dipping sauce of choice. Remove both ends of onion and peel. Cut the onion in half lengthwise. 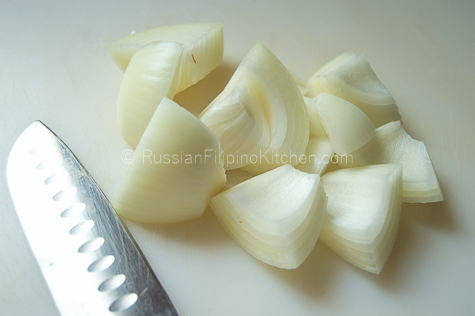 Place onion half cut side down and then cut crosswise. Repeat with the other half. Set aside. Smash garlic cloves with the flat side of the knife. Remove the skin and set aside. Wash pork belly under cold running water. 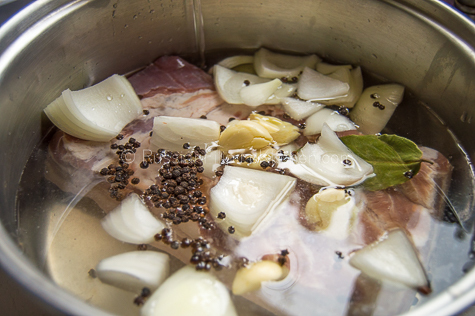 Place the slab of pork, smashed garlic cloves, onion, salt, peppercorns, and bay leaves into a large cooking pot. Add enough water to cover. Place pot on the stove and bring to a boil over high heat. Once it boils, turn down heat to medium low and simmer for one hour until the meat is tender, removing scum (that dark layer of froth that rises to the top) with a spoon. To check pork belly for doneness, poke with the tip of a knife or pork. It should cut through easily. Turn off heat and remove meat from pot using a tong, then place on a baking sheet lined with paper towels. Wipe excess moisture and let it cool to room temperature. Refrigerate overnight to air-dry. Note: Don’t throw away the pork stock. Strain and place in a container, then freeze or refrigerate for later use. 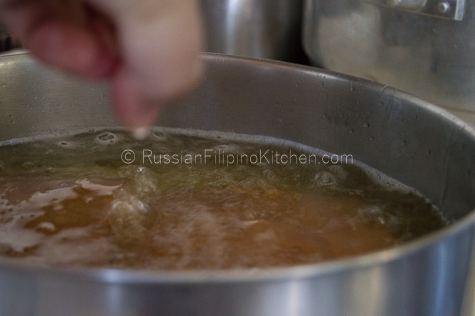 It gives excellent flavors to soups and also a great when making pancit. Turn on stove to medium high. Fill a deep wok or frying pan with enough vegetable oil (about 4-6 cups). 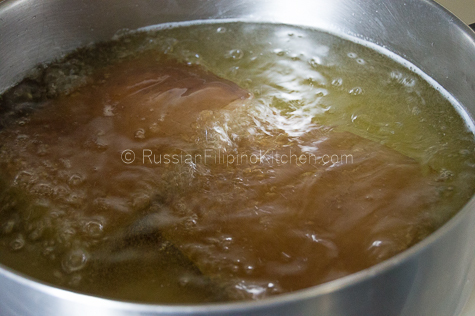 Wait for the oil to get very hot (shimmering but not smoking) and add the pork belly in to fry. Place a splatter guard on top of the pan and step back while it’s frying. The oil will bubble and you’ll hear a lot of noise at first. After about 3 minutes or so, dip your fingers in a bowl of cold water and carefully lift the splatter guard and sprinkle water into the oil. DO this a couple of times until the pork belly finished frying and it turns golden brown, and the skin looks puffy. But again, please exercise extreme caution! Remove the meat from the pan and place on a plate lined with paper towels to drain excess oil. Let it cool completely before slicing into serving portions. Arrange on a plate and serve with dipping sauce of choice. I like this recipe! thanks mam additional knowledge on how to cook lechon kawali, i love it !!! Thanks, Joefrey! Good luck making lechon kawali! You are Welcome MIA, not only lechon kawali i like it? but your site Russian Filipino KITCHEN, i interested all menu have complete details is easy to understand to follow those guys like me love for cooking..Thanks and Godbless !!! Oh my, your comment makes my heart swell with pride! Thanks a lot, kabayan! I’m so happy you enjoyed visiting my blog and trying out the recipes. God bless you too! Thank u so much for sharing your recipe! We liked it so much and the humba too! I’m so glad to hear that Jo-Ann!…Come back often and try some of my other recipes :-)!